It is commonly known as gac, from the Vietnamese gac or quaả gac (quaả being a classifier for spherical objects such as fruit). It is known as mùbiēguo) in Chinese, and variously as Baby Jackfruit, Spiny Bitter Gourd, Sweet Gourd, or Cochinchin Gourd in English. In Thai it is pronounced fahk khao. The latin name is Momordica cochinchinensis. It can be found throughout the region from Southern China to Northeastern Australia, including Thailand, Laos, Myanmar, Cambodia and Vietnam. An up and coming super fruit, Gac has been dubbed the “Fruit from Heaven.” With its exceptional flavour and vibrant colour, gac fruit is used in traditional Vietnamese dishes to mark special occasions. Be it a wedding or the arrival of a new year, its dark orange pulp expresses life, vitality, and longevity. Studies in recent years have supported this conviction by revealing the high levels of antioxidants contained in gac. It is no wonder that the Western world is turning with enthusiasm towards this unique fruit. 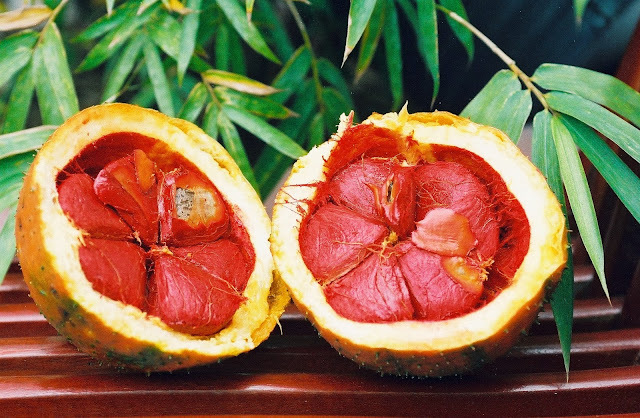 The brilliant red-orange hue of ripe gac fruit is due to its high content of beta-carotene and lycopene. In fact, gac has been found to contain 76 times more lycopene than commercial tomatoes. Beta-carotene and lycopene are antioxidants capable of quenching free radicals. This action is documented to provide lycopene and beta-carotene with its protective effects against disease. The body also converts beta-carotene to Vitamin A, which promotes a healthy immune system and helps to prevent eye problems. Not only has gac fruit been linked to these health benefits, it is also has a unique taste. The flavour of this spiny gourd is reminiscent of cantaloupe with hints of green melon and carrot. While it is not a flavour familiar to the Western population, it is well accepted in gac-producing countries among both adults and children. Thus, the possibility of using gac as a dietary supplement to overcome the menace of vitamin A deficiency in Vietnamese children has been investigated. The high bioavailabilty of pro-vitamin A in gac fruit and its agreeable flavour make it an ideal candidate for supplementation. Traditionally, gac has been used as both food and medicine in the regions in which it grows. Other than the use of its fruit and leaves for special Vietnamese culinary dishes, gac is also used for its medicinal and nutritional properties. In Vietnam, the seed membranes are said to aid in the relief of dry eyes, as well as to promote healthy vision. Similarly, in traditional Chinese medicine the seeds of gac, known in Mandarin Chinese as mùbiēzi, are employed for a variety of internal and external purposes. Lycopene is helping for macular degeneration affect the sight too. This is become the reasons in Vietnam, that Gac fruit membranes are used for promoting the health vision and helps to cure dry eyes. Protecting the tissues of eyes from exposure ultraviolet light and reduce oxidation are caused the gac which has the zeaxanthin. Gac fruit health benefits with the existence of beta carotene are reducing the risk of blindness also to maintain night vision. With helping to develop white blood cells it can enhance your immune system. The important role in gac fruit health benefits is developing of healthy embryos. The antioxidants property from gac fruit is provided the most of health benefit for your health. Preventing the oxidation of LDL cholesterol, gac fruit health benefit helps you to avoid atherosclerosis that is the precursor depositing on your artery walls. The levels of cholesterol in your body should be kept to within limits; atherosclerosis can narrow the arteries leading to strokes and cardiac problems, especially in arteries of the brain. Besides that gac fruit health benefit also helps maintain prostate health and supports the immune system. It can be done because of content of Vitamin E. Easily Vitamin E can destroy free radicals, which is the benefit of beta carotene. This is the first line of your body defenses against free radical and each molecule neutralize unto 20 free radical molecules before it destroys. 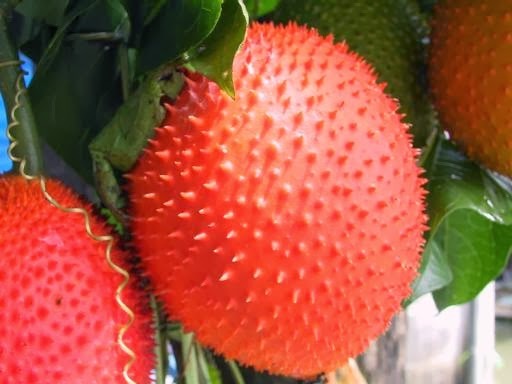 This is done to help in saving the other antioxidant like Vitamin E.
Gac fruit is easy to grow and can commonly be found hanging from the lattices of Vietnamese homes. However, due to its short growing season, it is only available from November to January. Before I took Gac fruit juice I did not even know what Gac fruit was until someone introduced me to it. I tried the juice a few times and was skeptical despite all the hype around how Gac fruit can improve your health. Eventually I gave in and tried some Gac fruit juice. I felt fine before I tried the Gac fruit juice so I thought it wouldn’t do much for me. But, within a day, Gac fruit juice worked its magic on me. I felt more alert, ate less and was more energetic. Within 2 days, I felt better, much healthier, my back pain was gone, my joints were all in place, etc etc. The health benefits of this Gac fruit juice just went on and on.